How To Buy Diamond Rings Tip #1 - Buy diamond rings where the center diamond is certified by a leading independent grading laboratory like GIA, or EGL. Any diamond you buy must be certified but just as important as the certification is who does the certification. If a jewelry store is selling a diamond and they are the ones that provide a certification for it, it may not be an unbiased view of the diamond. To buy diamond rings online you must always ensure the diamond is certified by an independent source just like all the loose diamonds at Novori Jewelry. A diamond certificate describes and identifies a particular diamond and very specific characteristics of that diamond. Some diamonds even have the certificate number laser etched into the side of the diamond. This will ensure your value in your diamond purchase and protect your diamond investment. How To Buy Diamond Rings Tip #2 - Ensure that the ring setting is made from solid quality metals. This may be something you would never think to ask about but some ring setting are made of gold tubing and are hollow inside. If you want to buy diamond rings online and purchase a quality piece of fine jewelry, ensure that the company you purchase from makes their rings by individually casting the setting. At Novori all our engagement rings are made in the USA (not imported from overseas) and are cast with solid metals like gold, platinum and palladium. You may be able to locate some jewelry 'bargains' sites showing 30% or 50% or 80% off, but remember you usually get what you pay for. At Novori we keep our prices as low as possible every day for every customer and provide value with quality jewelry made in the USA. How To Buy Diamond Rings Tip #3 - Make sure you know what style of ring your fiancee likes. to ensure you get a ring that fits properly. This may seem like a minor issue but it is important to make sure that when you buy diamond rings online the fit is good. Some rings which are more elaborate in design are also more difficult to re-size. Novori does offer a free re-size within 60 days on most engagement rings and this is a great service, but you do have to send the diamond ring back to us for us to do the work and she will not be able to wear the ring for at least a couple of days or for as long as it takes to do the work. If you buy a tension ring it is even more difficult to resize and there are costs involved for this because of the design characteristics of a tension ring. It is always best if you are able to have the finger sized at a local jeweler or at least use a ring finger sizer (free from Novori - just call 1-877-877-4141 to request one) or an existing ring that she likes to wear to determine the ring size. Having the correct ring size will make your shopping experience easier and perhaps avoid resizing the diamond engagement ring later on. You have probably met some over-enthusiastic salesperson who really doesn't listen to what you want or need. When it comes to diamonds, diamond rings, diamond jewelry and other items of value, you might run into the same salesperson. One of the joys of shopping online is that you can do it at your leisure, in the comfort of your home without the sales pressure. When you buy diamond rings, make sure you set a budget for yourself and stick to it. At Novori Jewelry, you can even buy Perfect & Complete diamond rings including the center diamond that is within your budget range. Again, if you need help while you buy diamond rings, we are here to help. 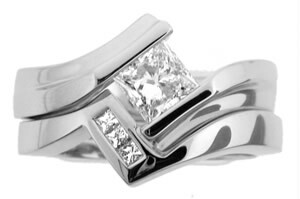 We have help thousands of other find the perfect ring and we would be honored to assist you as well. A general guideline is to spend 2 months salary on an engagement ring but this is not a hard and fast rule. Don't be oversold by salespeople. 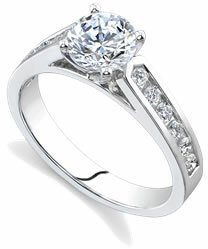 Buy diamond rings that suite her taste and fit your budget. How do you tell if an online jeweler is reputable and that you should buy diamond rings from them? There are a few things you should look for. First make sure they are registered with the Better Business Bureau. Ensure they have contact information listed on their web site. Not just a phone number but a physical address where they do business. Otherwise you could be buying off of some auction sites where anyone can list products and much fraud exists. Novori Jewelry has been selling online for many years and works with jewelry craftsman that have been in the jewelry business for over 30 years. We are listed with the BBB as well as other jewelry organizations that oversee and regulate the jewelry business. When you buy diamonds, diamond rings and diamond jewelry online, make sure there is a good return policy just in case. This is also a good sign that the company will stand behind their products. Finally, give us a call to talk to a trained jewelry professional to assist you personally with your sale. You always want to know that someone is there for you while you buy diamond rings online.